In what container should I put lemon water for storage? I have a polypropylene water container and some large PET bottles. I don't know if it's OK to put lemon water in there. I read from somewhere that you shouldn't put lemon water in plastic or aluminum as acid in lemon can leach contaminants out of the container. What containers are safe for storing lemon water? Both glass and stainless steel are non-reactive and should be fine. Stainless steel, glass, enamel, and glazed ceramic are examples of non-reactive materials that are not affected when food items such as tomatoes with a high acid content come in contact with the surface of the utensils or equippment. Are you talking about mixing lemon juice with water? Or are you talking about a commercial sports drink such as: True Citris Lemon Drink? If you are talking about the mixed drink, the product's website indeed do warn the consumer against using a plastic water bottle for the mixed drink. 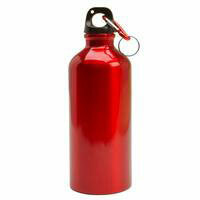 However it actually recommonds using the lightweight aluminum water bottles. Turns out we should have kept that metal container, because the one-time-use plastic bottles that water, soda and juice come in are proven to leach DEHP, a carcinogen, into the liquids. And old-style Nalgene bottles (those wide, smoked plastic ones that a lot of camping types love) are also no-no’s. They leach BPA, a synthetic hormone that may cause cancer. If we are talking about lemon juice (from the actual fruit) mixed with water, one should stay away from storing any type of acidic food in metal containers. There are of course some metals which are safer to use(less reactive to the acid) but as a rule of thumb you shouldn't. Aluminum is however reactive to the acid and so you should avoid using aluminum bottles. To actually answer your question, check on the bottle's website to see if they say it is BPA free. If it is indeed BPA free, then you may use the bottle to store the lemon water. If not, then use a glass jar. This of course is impractical if you intend to carry that bottle with you on a jog or something. Another option is to take a look at this: BPA-free Nalgene bottles. Not the answer you're looking for? Browse other questions tagged storage-method lemon or ask your own question. How should I organize my fruits for storage? When should I use lemon zest and not just juice? Pickled/preserved lemons/limes - grams of salt per kilogram of fruit? How should I store chilli for freezing and later defrosting? How to know if a recipe is acidic enough for storage/bottling? What is the difference between a lemon pound cake, a lemon loaf, and a lemon bread?